Adding Orange to the Living Room | Welcome to the Creative Collage - Come In and Stay Awhile! 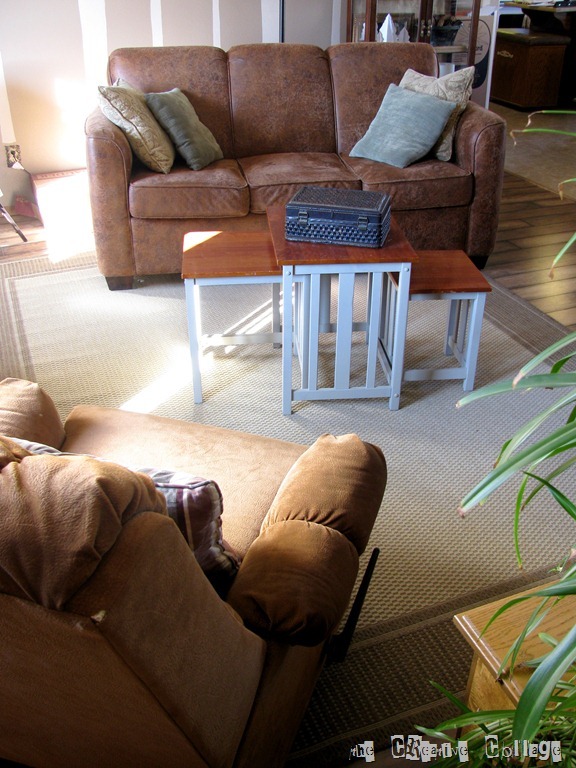 When we took out the carpet and had laminate installed, I knew that we would need a rug for the center of the room. I looked around at different stores but couldn’t find anything I loved and especially at the price I wanted to pay! (oh the joys of being a cheapskate) I love to change things out and if I put a lot of money into something, then I feel like I am tied to it for a good long while. Maybe you could call it commit-o-phobia. Anyway, what we ended up with was actually a very neutral 8×10 rug that came out of the outdoor rug section of a local hardware store. I think I paid $50 for it. A side note – please ignore the big boxes behind the couch – they have been there for awhile – waiting on my finishing the bed for the master bedroom. Please don’t judge me on the brown tips on the leaves of my plant. It has been horribly dry this winter and I have not been doing well watering it! It has worked fine for the last couple years, but I have been keeping my eyes open for something with more color – doesn’t it look like it needs something besides brown?!?!? I love brown, but I definitely need to expand my horizons! My husband also complained that it wasn’t soft enough to lay on when playing with the kids, so another mark against it. Well, my patience paid off – it finally happened. I found a rug that I loved with lots of colors that goes well with the other pieces in the room. And it didn’t break the bank either. 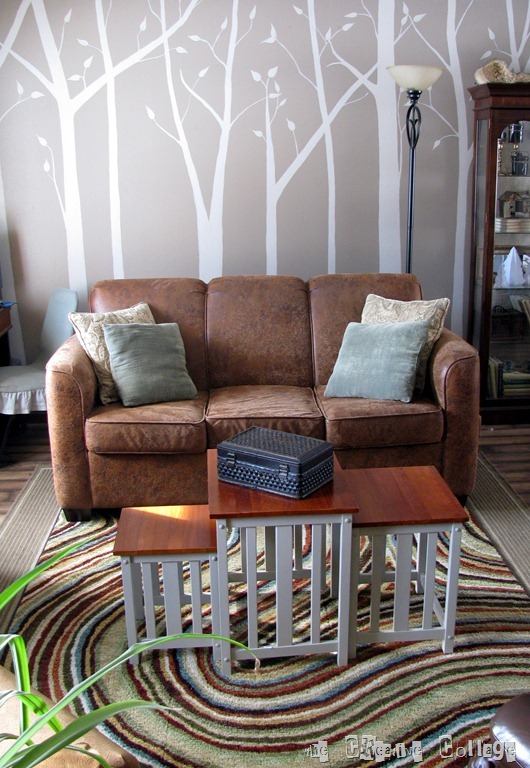 I love the fact that it has a woodgrain feel because it compliments my silhouette trees on the wall. 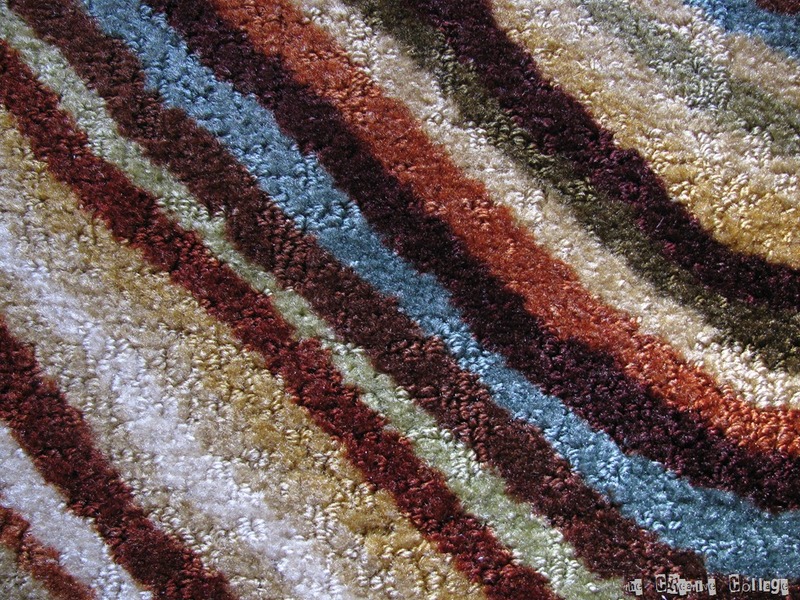 Here is a close up of the colors in the rug itself. I am looking forward to incorporating some orange/rust into the room. I ordered new material for curtains, pillows and bench seat cover. Hopefully it comes soon, because once summer hits, indoor activities come to a screeching halt around here! I have an idea for a new, unique coffee table that I hope to work on this spring yet also! This entry was posted in Home Decor and tagged Orange, Rug by Jo at theCreativeCollage.wordpress.com. Bookmark the permalink. Where did you find the rug? I really like how it incorporates several colours in a non-traditional pattern!